Dimensions 1.25 by 5 by 6.75 in. 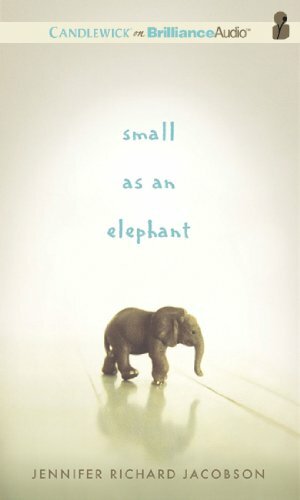 Amazon.com description: Product Description: When eleven-year-old Jack Martel crawls out of his pup tent on the first morning of his camping trip with his mom in Acadia National Park, he notices right away that something isnÃ¢ÂÂt right. Where is his momÃ¢ÂÂs tent, and their rental car? And where is his mom? Any other kid might panic, might even go to the police. But Jack isnÃ¢ÂÂt like other kids. And his mom isnÃ¢ÂÂt like other moms. Jack knows that itÃ¢ÂÂs up to him to find his mom before someone figures out whatÃ¢ÂÂs happened and separates them forever. But finding his mom in the state of Maine isnÃ¢ÂÂt the same as finding her in their neighborhood back in Boston. With nothing but a small plastic elephant to keep him company, Jack begins his search, starting with all the places theyÃ¢ÂÂd planned to visit together. But as the search drags on, a dark thought plagues him: once he finds his mom, will he ever be able to forgive her? About: Jack’s mom is gone, leaving him all alone on a campsite in Maine. About: When eleven-year-old Jack Martel crawls out of his pup tent on the first morning of his camping trip with his mom in Acadia National Park, he notices right away that something isnât right. About: When eleven-year-old Jack Martel crawls out of his pup tent on the first morning of his camping trip with his mom in Acadia National Park, he notices right away that something isn’t right. About: Jack's mom is gone, leaving him all alone on a campsite in Maine.